Size: 3.5" x 5.3" x 0.5"
The PocketMate 120 was introduced together with the sibblings PocketMate 100 and PocketMate 140 late in the market. The PocketMate 120 is the successor of the PS-3660i. 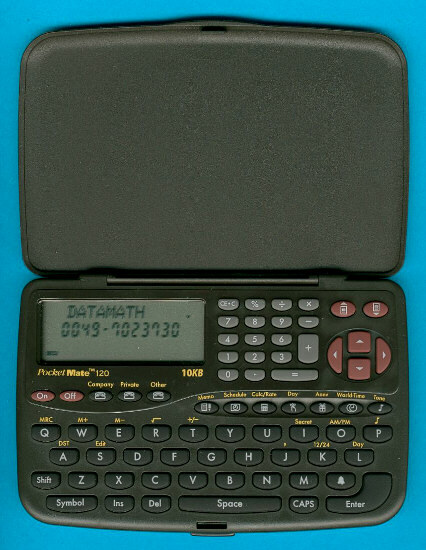 The display of the PocketMate 120 consists of one line for alphanumeric characters and two lines supporting only numbers. The inside view of the PocketMate 120 gives a simple construction using only one Integrated Circuit scanning the keyboard, driving the display and storing data in the internal memory and one additional memory chip. A closer view gives you the differences between this PocketMate 120 and the simpler PocketMate 100. The area marked RAM is populated with a 8k Byte chip on the PocketMate 120 and kept free on the PocketMate 100. The small chip is placed on the printed circuit board (PCB) and bonded with about 28 wires direct to it. A small "top glop" - the black epoxy resin found on top of the Application Specific CPU on the right - is placed above the circuit to protect it. This technique called chip-on-board (COB) is very common in far- east assemblies of the late 90s. Early products like the PS-2100 used COB technology to reduce the size of the PCB, later designs to lower manufacturing costs. The design of the PocketMate 120 fits neatly with the PocketMate 300 series. The whole PocketMate series was discontinued in 2000.